What does it take to make it to the top level? Only those who have been there can really say. But how often do you get the chance to get into the mind of someone who has played Test cricket? Even if you did get the chance, would you know what to ask? Through this course you can learn the secrets that helped myself, Alvin Kallicharran, become a regular in the best Test team of its time: The West Indies. Follow my advice and you can make the most of your talent, moving up standards. As a batsman, like Kalli, you will be able to play the best fast bowlers, dominate spinners and build large innings with patience and confidence. Discover how to read a bowler and outsmart him. Learn the one simple method that forces a very fast bowler to bowl where you want. Avoid the classic mistake that gets mediocre players out against the swinging ball. Boost your concentration levels by learning how to stay focused in a long innings. Stop getting out to spinners by changing your approach to playing them. Listen to my answers to classic batting issue like getting out early and defeating nerves. Work out your own captaincy style as well as learning about mine. This is achieved through a fully interactive coaching course that helps you work out for yourself the best methods. The videos, workbooks and presentations will allow you to learn the secrets quickly and effectively so you can take the straight to your next net session. Thanks also to the exclusive discussion forum you will be able to chat to other enrolees on the course and get direct feedback from me and my team of coaches. Click 'buy' to get started on your road to the top. In this video you will learn the important technical points of playing against pace. I also show you my methods for scoring against accurate pace and how to avoid the problem of getting stuck on the back foot when the bowler is banging it in. (4m 51s). 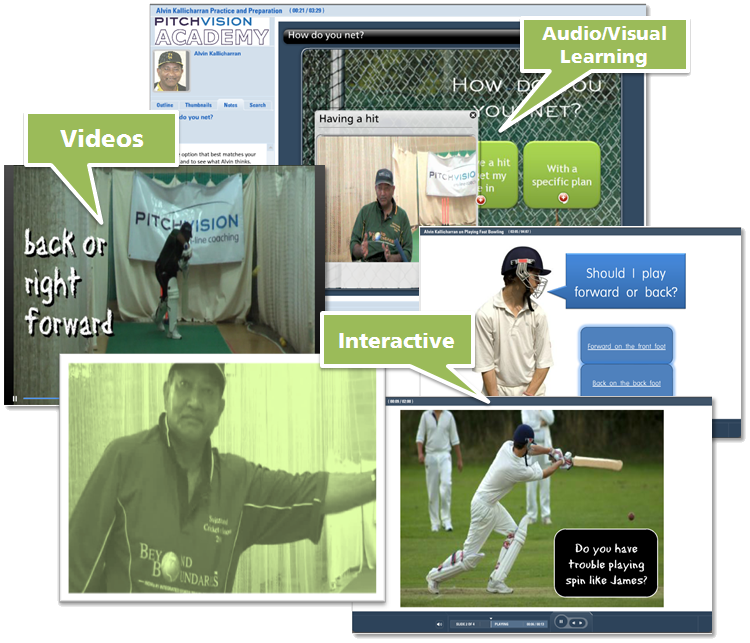 This interactive guide will help you work out the best way to play against different types of fast bowling for yourself, although I will be on hand to give you my advice for each situation. Playing the moving ball well is the mark of a good batsman. Discover the secrets here. Learn how dominate spinners without resorting to slogging. Use this interactive troubleshooter to find out the two things that solve 90% of problems people have playing spin. The way you prepare is crucial to making it to the next level. Find out the best way in this chapter. Find out if the way you prepare matches my tips. In this presentation I also give my advice on solving common problems like dealing with tension and failing to build a big innings. As captain of the West Indies I led many great players. Get my advice on being a good leader here. This online workbook is designed to allow you to work out your own captaincy style by asking you to think through your answers. Don't worry I'll be dropping in to tell you what I think too. Watch the full version of my discussion about captaincy that appears in the workbook (10m 07s). DIscuss the course with other users here.